100 BILLION YEAR OLD UNIVERSE? Abstract: Dark Energy is a fact. Dark Energy is not an extrapolation such as the Big Bang, or an extrapolation of extrapolations, such as Cosmic Inflation. Dark Energy enables a completely different cosmology. Taking Dark Energy seriously renders Cosmic Inflation and the Big Bang superfluous… And make the universe much older than usually considered. The basic reasoning establishing the Big Bang is of primary school level. And yet, from recent observations, it is probably erroneous. I propose that the universe is rather of the order of 100 billion years old, rather than the official 13.8 billion [sic!]. Why do I think the universe is much bigger, and much older than most accredited, professional cosmologists do? Why would celebrity physicists be misinforming the public? Galaxies To Infinity. 100 Billion Years Old, I Say. Boldly averaging observations of red shifts in our neighborhood, it has been artistically found that galaxies located 3.2 million light years away recede at 72 kilometers per second (that art was involved is obvious when one gets in the detail… And why Hubble got the numbers wrong by a factor of two initially). Divide that inter-galactic distance by that speed, and that should tell a primary school student when the universe started. The good news: physicists understand this. The bad news: it’s all too simple, reality seems to disagree. Let’s do the computation in detail. (3) 10^19) kilometers (3 times ten billion billion kilometers). Divide by 70 kilometers per second, to find how many seconds it took for galaxies to separate 3.2 million light years: that’s ½ (10^18) seconds. Now there are around (3) (10^5)(10^2) seconds in a year. One gets roughly 14 billion years. 14 billion years ago, or so, the material of that 3.2 million light year away galaxy was next door. From, there, applying the Principle of Homogeneity (PH: that everything is everywhere roughly the same), one deduces that all those things that became galaxies were next to each other. Notice that this recourse to PH is a philosophical jump: it seems likely, because it is the simplest we can think of, but it’s not a sure thing. The only way this could have happened is if this expansion all started in the same place… in time (not space!). Presto, you have the result that the history of the universe is that of a Big Bang that started 14 billion years ago. So far, so good. Notice a second philosophical jump occurred: to get to the conclusion that there was a Big Bang, we assumed that the expansion happened at the same rate, all along. That sounded like the easiest hypothesis, 80 years ago (or when the Big Bang was explicitly formulated, around 60 years ago). But there was NO proof, that the expansion had been at that rate all along, and some observers of things cosmological, or theoreticians, begged to differ (even during the 1960s). I certainly did not agree with the certainty that the preceding reasoning was a sure thing, because it was not. I do not trust concept that are viewed as sure things, when obviously they are not. I view in them probable examples of herd effects. However, in the last ten years, it turned out that, to everyone’s amazement, a fact unanticipated by the majority of cosmologists emerged. The rate of expansion was found to be increasing noticeably. A force expanded the fabric of space ever more. It was called “Dark Energy” (energy, because that’s what one needs to expand space, dark, because the force vector itself could be not be seen; also there already was one problem, called “Dark Matter”, mass distributed all over, dwarfing the visible mass). 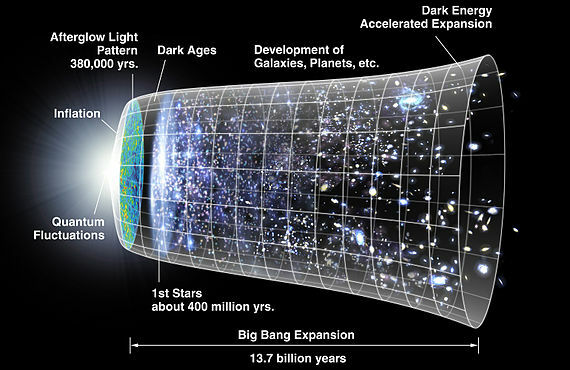 The very existence of “Dark Energy” immediately busted the “universe is 14 billion years old” conclusion. Indeed, one cannot assume the expansion was 71 kilometers per second, all along, when we see that this expansion is now accelerating. It’s changing: get it? C H A N G E… It’s changing now, so it should have been changing in the past. It’s more logical to suppose the expansion was always there, and accelerated all along, that the expansion accelerated in the past as it does now. So as the expansion of the universe is NOT linear now, it’s only simpler, logically, to suppose that it was NOT linear in the past. Instead, it looks as if, in first approximation,the expansion of the universe was some sort of exponential tapering fading in the past. On the back of an envelope, considering the present rate of acceleration of the expansion, and extrapolating that acceleration in the past, your generous servant can determine the universe ought to be 100 billion years old, rather than 14 billion years. Some will whine: and what of the Cosmological Background Radiation? Well I have a Quantum answer to that. There are also other explanations available such as Olbers Paradox, and Tired Light. Why is it that physicists are presenting the date of 13.7 billion years for the age of the universe with so much certainty? Because smug, god like certainty, is what sells. To know things that only an oligarchy knows, especially if this esoteric knowledge violates common sense, can only make one famous, thus powerful. Hence well fed, the pelt lustrous and the mien proud. Some do not require more than this: they are simple apes, greed is their event horizon. Real thinkers are made of nobler stuff. 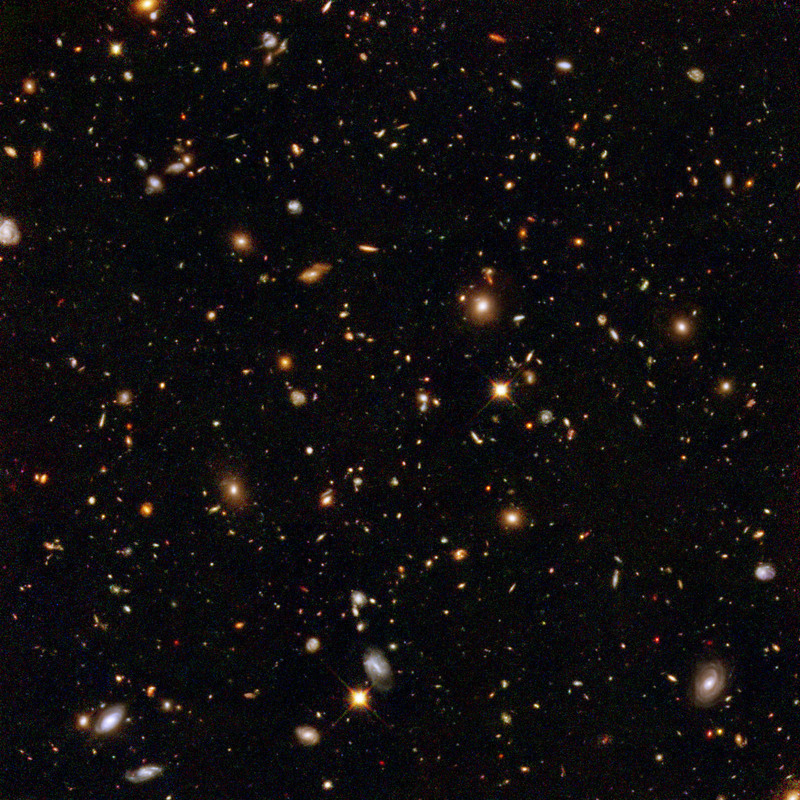 Meanwhile, the universe is out there: let’s look carefully, but emotionally, at the picture above: millions of galaxies, as far as we can see. One cannot avoid the feeling that this universe is much older than simply thrice the age of the Earth. And now that’s what the simplest logic, clinging to the established facts, embraces.